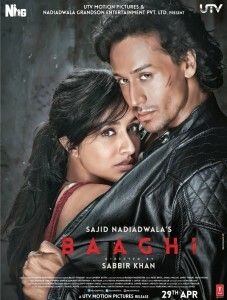 Bollywood’s latest romantic action drama ‘Baghi’ hit the theaters today (29th April) worldwide. After the great success of Heropanti, Tiger Shroff is back with Baghi. Directed by Sabbir Khan and produced by Sajid Nadiadwala under his banner Nadiadwala Grandson Entertainment, the film features Tiger Shroff and Shraddha Kapoor in lead roles while Telugu actor Sudheer Babu appears in the antagonist role. The movie was reported to be based on 2004 Telugu hit movie Varsham starring Prabhas and Trisha in lead roles and Gopi Chand in a negative role. Check out Baaghi Hindi Movie complete Review, Rating, Story-line, Plus points, Minus points below. Baaghi (English: Rebel) is the story of Ronny (Tiger Shroff), a rebellious 23-year-old from Delhi. Fearing his unruly and angry temperament, his father sends him to a disciplinary academy set in a sleepy town in Kerala. While traveling to the academy he meets Siya (Shraddha Kapoor) who also carries a rebellious streak but nonetheless spark fly between them. Ronny and Siya were madly deeply in love with each other, who were separated by the villain played by Sudheer Babu (Raghav). Raghav got a building full of goons, but the love of Ronny and Siya was so strong that none of the goons can affect them. The movie revolves around the love, rebel, and actions. Varsham is a huge success in Tollywood and remained as the best film in Prabhas’ career. The basic plot of the movie is taken and was remade in Hindi, but with more action sequences than in Telugu. The intense muscular hunky man character played by Sudheer Babu is receiving positive reviews from the audience. Stay tuned with us. Here we will update Baaghi movie complete review, Rating, box-office collections & other movie reviews. Press CTRL+D right now to bookmark this page.